I hope you all are having a good day today, for us in Philadelphia it has been raining for the last couple of days and today is no exception. So on this rainy day I have decided to blog a little bit. I had been waiting all year to do a cake like this.. I have seen plenty of pictures on the internet from other cake decorators but no one had ordered from me until a couple of weeks ago! Yes folks, I finally got to do a Lorax theme birthday cake:) See for us cake decorators we love it when we get to do new characters or design we haven't done yet.. it gets kind of boring doing the same cakes. 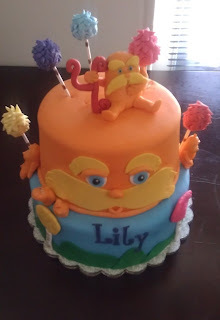 So when an old York client L, asked me if I could do a Lorax theme cake for his daughter I jumped at the chance to do it. I have been wanting to do a Lorax figure for a while now... of course he was the first thing I made for the cake. Of course I made some Truffula trees to go on the cake as well. I love the meaning behind the story and I think the movie was soo cute. I think kids are never to young to learn more about conservation efforts. The only thing that dampened my mood when the cake was done was realizing now I have to drive 2 hours to deliver it back to York. So I packed up the cake. Jayden and myself and we made the trip back to York to drop off the cake. By the time I got back home it was already dark and half the day was gone so from that experience I have decided that unless its for a huge party cake or a wedding, I will be limiting by deliveries to York. It just takes up too much of my time to deliver just one cake. I love my York customers but doing that drive all the time is a bit much. Other than that, this cake was soo much fun to make.. I hope I get to make another so I can do something a little different.